An excellent audience was in attendance for the recent ‘Learning in Year 8 and Year 9’ Information Evening. 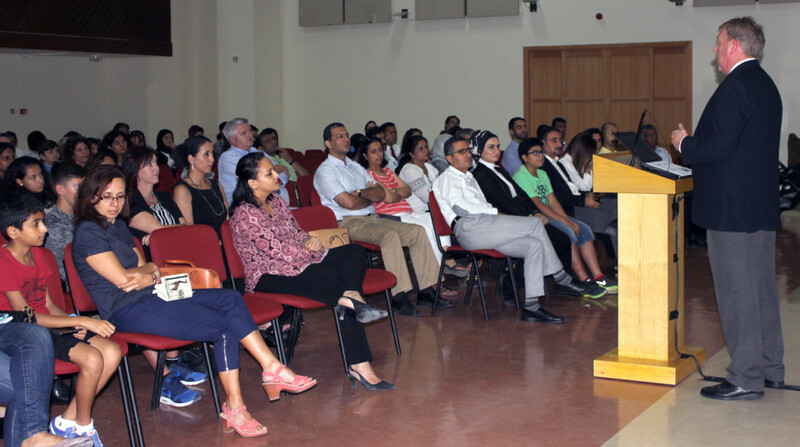 Presented by Mr Bryon Pearce and Mrs Hilary Rowark, Assistant Heads of Senior School, parents were briefed on a variety of educational initiatives and important information about the structure of learning in these two school years. Mrs Rowark discussed how the concepts of the Autonomous Learner, the Competent Individual and the Global Citizen provided an underlying philosophy towards personal development across the School, while Mr Pearce presented information on Evidence Based Teaching and the challenges ahead for young learners. The final phase of the evening’s presentation focused on the importance of developing a ‘Growth Mindset’, in short, encouraging our students to develop a ‘can-do’ mentality complete with the dispositions to overcome the many learning challenges ahead. The evening concluded with Mr Nick Wilson’s address, who celebrated recent examination success as well as the very positive feedback received from the recent BSME and BSO inspections in which the School achieved Outstanding Status.